College Writing Is Different from High School Writing— Why Not Get a Jump Start? This summer, The Cooper Union is offering a unique opportunity to get a head start on one of the most important aspects of your college career: writing and thinking at the college level. Why a Summer Writing Program? When you move from high school to college, expectations change. That’s what makes college exciting and challenging, but it can also be intimidating. In college writing courses, the old formulas no longer apply, and it isn’t enough to show that you understand the basic events or themes in a text. You’re expected to read closely and write analytically in order to make an argument. Even accomplished high school writers can struggle when asked to write in a new way; less confident writers may feel overwhelmed. But when you have the necessary techniques and approaches, college-level writing can be exhilarating, not daunting. 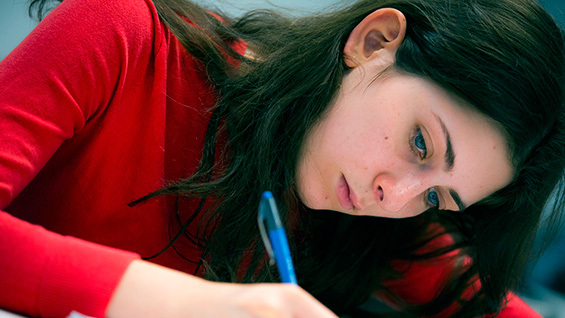 The Cooper Union Summer Writing Program gives you the skills you need. How It Works: The best way to learn to write more effectively is to learn new approaches, practice them, and receive feedback. Our classes provide a rigorous and supportive environment that makes this possible: both the in-person and online classes have a seminar format that combines discussion with hands-on reading and writing. Classes meet Monday-Thursday during the week, with optional special topics workshop intensives on Fridays. All classes are kept small so each student receives extensive individual attention. Online classes take place in a real-time virtual classroom that lets students interact with each other and the instructor and receive immediate feedback. The Summer Writing Program is modeled on the unique work we do at Cooper Union. Our approaches are designed for students with diverse learning styles and are effective both for students who don’t identify as writers and for those who enjoy writing. It’s effective for students across all interests and potential majors. * There are two sections: Section A meets 10-12 & 1-3. Section B meets 11-1 & 2-4. We will do our best to accommodate section requests. **Pay in full by June 1st to receive a 10% tuition reduction. To sign up see the registration and payment page.